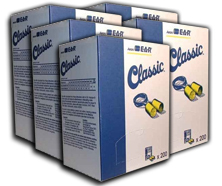 Foam ear plugs are soft and comfortable, and come in a variety of colors, sizes, shapes and materials. Foam ear plugs are great for sleeping, studying, motorcycle riding, shooting, and working or playing in noisy places. Corded foam ear plugs offer all the same benefits as a regular disposable foam ear plug, but with an additional cord that helps keep your ear plugs from getting lost -- particularly if you need to remove and reinsert your ear plugs many times throughout the day. By purchasing by the case, you can get our best and deepest discounts, making it easy for you to acquire affordable, high-quality hearing protection for your large organization or event. For a quote on large orders starting at 10 cases, please send your request for quote by or fax: 1-918-512-4188. (NRR 30) Hearos SoftStar NexGen foam ear plugs provide the smooth roll-down of a cylindrical (barrel) design, with the softness of PVC-free UF foam. Star indicates proper method of insertion. Smooth skin for reduced irritation. Corded. Case of 1000 pairs. (NRR 33) Hearos Supreme Protection Series foam earplugs are made of FutureFoam™, a proprietary PVC-free UF foam material that provides a silky smooth fit for all day comfort and excellent protection from noise suitable for the most demanding environments. Large size, corded ear plugs. Case of 1000 Pairs. (NRR 30) Moldex Mellows® foam ear plugs are made of super soft, lightweight, 100% PVC-free foam in a popular bell shape. This tried-and-true tapered design ensures a comfortable fit, with little to no irritating pressure on the sensitive ear canal. Case of 2000 pairs. (NRR 33) SparkPlugs® UF Foam ear plugs are aexcellent all-around choice. Case of 2000 Pairs - Best Pricing! (NRR 33) Moldex Goin' Green® UF foam ear plugs are extra-soft low pressure foam and tapered fit for extended comfort. Case of 2000 Pairs - Best Pricing! (NRR 33) Pura-Fit® is designed for increased compliance and fewer complaints. The special foam is formulated for softness and comfort, and the outer surface is smooth, so it doesn't irritate the ear canal. Case of 2000 Pairs - Best Pricing!